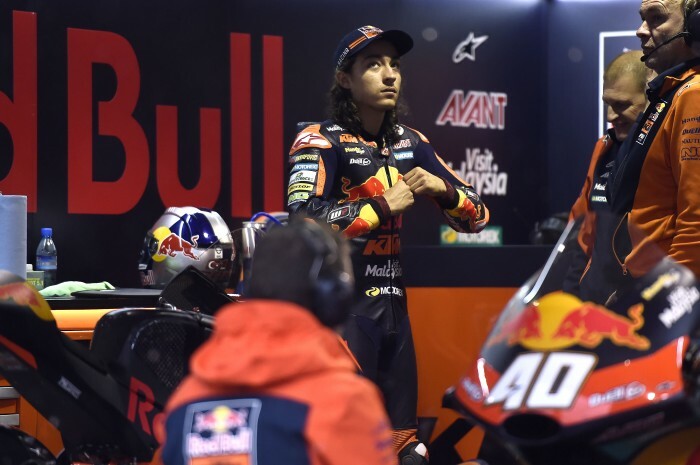 In a dream debut in the Moto3 World Championship, Can Öncü made history as the youngest rider to win a Grand Prix, aged just 15 years and 115 days. What did it mean for you to debut in the World Championship? What were your expectations before starting the Grand Prix? What were the keys to making this result possible? Valencia was a race that will go down in the MotoGP history books. Talk us through it. “I made a great start; In fact, I think it was the best start I’ve ever had, since that’s usually something that I find hard. I took off from fourth position and, on the second corner, I managed to gain a position and take third. During the opening laps I tried to follow the leading riders, but at Turn 6 I almost crashed so I decided to ease off a little; Finishing third would have been a great result for a wildcard. “Shortly after, I saw the two riders ahead of me crash out. At first I was a little worried because when a rider crashes it is a warning that you should be more careful. Unexpectedly, I was left alone at the front. When I saw that I was ahead of the chasing group by more than five seconds, I decided that I had to go for the victory. “However, it seemed as if the race was never going to end, since there were still sixteen laps to go and I had to set the pace myself. Normally in the FIM CEV the races last just sixteen laps, so for me it was like starting a second race. Also, at Turn 6 on the last lap, I thought I was going to crash. I was able to stay on the bike and win the race. What did you feel when you crossed the finish line and the entire Red Bull KTM Ajo team were on the wall to celebrate? In addition to being the youngest rider to win a Grand Prix, you are the first Turkish rider to do so as well. What does this mean for you and your country? It was a difficult weekend due to the wet conditions. Are you good at riding in the wet, or was it a tough Grand Prix for you? You have debuted in the World Championship in the best way possible. What will be the goal from hereon in?